...They want to be part of it. If you’re a brand looking to convince Gen Zers to set aside their Snapchatting for the eight seconds it takes to earn their attention and lasting loyalty...then hats off to you, friend. You’ve entered into a brave, new world of student marketing where the rules of well-executed, omni-channel campaigns no longer fully apply. It’s not for the faint of heart, but fear not. If you’re willing involve Gen Z in your marketing strategy—and not simply advertise to them—you’re headed in the right direction. When it comes to today’s students, conscious, quid-pro-quo marketing isn’t simply ethical—it’s profitable, too. While digital display advertising might be the “lifeblood” of today’s internet, accounting for 70 percent of ad revenue by 2021, don’t depend on that lasting forever. Just when you thought you could kick back, relax and let your display ads find their targeted audiences with unparalleled precision, along come the college students of Generation Z. With their ad-blocked mobile devices and their ultra-discerning eye, they’re earning themselves a worldwide rep as tough customers. Try as you might, chances are you’re trying too hard: You’re facing the most ad-proof generation in history, digital or otherwise. If you want to do business with a global audience that currently has $143 billion in spending power (and growing), you’re going to have to learn to play by the rules of the students. You’re going to have to learn new ways of cultivating brand loyalty because the old ways, the ones that worked so well with Millennials just a few years back, are quickly drying up. According to a recent study by Millward Brown, Gen Zers aren’t ones to go gently into that digital night and click when they’re told. Not only do Gen Zers skip online ads three seconds faster than their Gen X forebears, but they apply ad-blocking technology like you apply sunblock on vacation. Another section of the same report finds that 51 percent of Gen Zers use ad-blockers to “declutter” their web and in-app experience when browsing or shopping. To their credit, it’s not like brands haven’t anticipated the need to engage college audiences in other ways than simply pinning them with ever-better, round-the-clock, real-time ads. They’ve tried leveraging the discount-savvy instincts of Gen Z shoppers during one-of-a-kind global sales events like Black Friday and Cyber Monday in North America and EMEA, Singles’ Day in China or the Dubai Shopping Festival. The results have proven mixed: It turns out Gen Z students are last-minute, “at the midnight hour” shoppers compared to Millennials or Gen Xers. Saving is a good thing - but it’s tricky for a brand to subsist on one-time sales offers, alone. In the same way, brands have tried ramping up their cool factor by playing to the whims of in-the-know collegiates. But do collaborations and partnership strategies actually foster loyal relationships with consumers? Have they been able to drive brand advocacy, year after year? The results, again, seem hit and miss. While Britta continues to inspire loyalty from Millennials and Gen Zers alike through its partnership with NBA basketball legend, Steph Curry, a celebrity endorsement isn’t always the “magic formula” it’s cranked up to be. Case in point: Bing massively boosted its global search traffic by collaborating with rap legend Jay-Z and (equally legendary) ad agency, Droga5. But that was all just for one social media campaign. Its moment in the cultural spotlight dimmed quickly thereafter. What if brands took a new approach to today’s students? What if they stopped “marketing too hard” and stopped approaching to Gen Zers as all-knowing, data-driven wizards of ROI? What might they discover about their “target audiences” if they began treating them as equals, viewed them as collaborators and even provided them the means to become brand ambassadors in their own right? A lot of things would happen, for sure, but chief among them, would be this: They’d discover that more than anything, Gen Z students have needs that go well beyond the need to be sold something. And therein lies the opportunity—both for brands and their audiences, alike. Very rarely do you hear of brands actually helping their consumers - and today’s students could stand a solid dose of help. The annual tuition, room and board for an in-state American state university averages out to around $24,610 in 2017. And in the UK, things aren’t looking any less pricey, adding up to around £9,188 on average, according to one study. But here’s where brands can come to the rescue of a generation of fiscally stranded collegiates. Companies like TOMS, with its brand promise of giving out a free pair of shoes to someone in need for each pair of shoes purchased, already seem to get it. Likewise the stylish folks over at Warby Parker, with their “buy a pair, give pair” company guarantee seem in on the secret: You’ve got to help others in order to be remembered. Increasingly, companies seem willing to play by these new rules. Take Mossman Australia, the fashionable Australian swimwear designer that’s engaging students and Gen Zers in a way that’s not only inspired, but refreshingly sincere. Mossman Australia partnered with UNiDAYS and took to social media to invite Australian students to come up with their own, unique designs for Mossman Australia swimwear. The two winners of the competition would have their designs featured in Mossman Australia’s SS18 collection: a nice bit of nationwide exposure for an aspiring fashion designer. It’s the perfect instance of a brand willing to go the distance in treating students as partners - both in terms of creative ability and marketing savoir faire. And it generated brand-lift for Mossman Australia that advertising couldn’t have bought: Throughout the contest, student engagement with Mossman Australia rose by a full 550 percent. Let those numbers speak for themselves. By helping, inspiring and collaborating with the students of Gen Z, marketers have everything to gain. But most importantly, they stand to gain loyal, potentially lifelong customers. Why? It’s simple, really: Everyone remembers the face of the person who once saved them. It’s a lesson in philanthropy that translates nicely over to the ROI-driven world of marketing—if companies are willing to seize the day and approach their customers as partners. 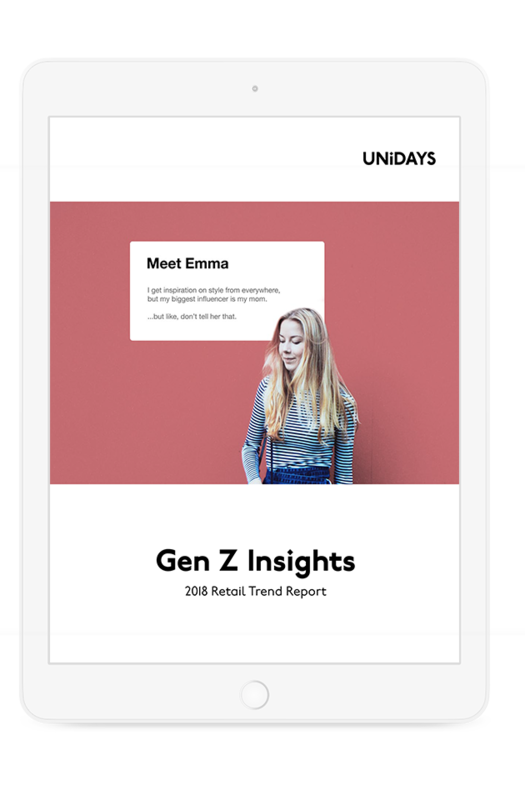 Gen Z Insights is brought to you by UNiDAYS, the world's leading Student Affinity Network. We help brands connect with over 10M Gen Z students around the globe, giving them the power to make every experience more valuable and rewarding. As brick and mortar stores continue to close their doors, many retailers are left wondering what’s next. Our report will take you inside the psyche of Gen Zs and outline exactly what they want from retail.